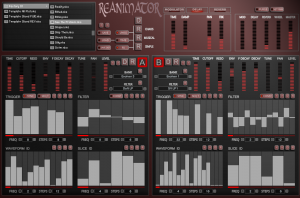 Reanimator is an advanced dual sequencer which re-sequences Loop Slices. there are 2 identical machines and each can sequence Trigger/Volume, Filter Cutoff, the Wave Index (which of the 126 loops in a bank will play) and which of the 16 Slices will play. This is a powerful and creative process which can yield surprising results. 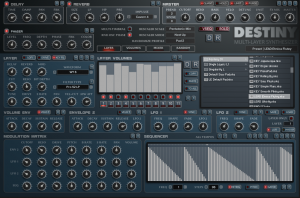 Furthermore, the Modulation Wheel is used to offset the current Wave Index for instantly remixing the Sequence, and it can also be used to find the most interesting variation and then by using the Set Wheel button store it to the sequencer..
Destiny features 11 Layers each of which contains a Singularity Synth which is also included as a 2nd Synth. The Layers can either be stacked into a Multi Layer Synth or used as a Multi-Timbral Sound Module. Each Synth has 2 Envelopes, 2 LFOs, a Sequencer which are assigned to Destinations via a Modulation Matrix. Also included is Singularity which is made from a single Layer of Destiny. It still has 11 Layers but these are solely used for creating a great sounding Unison. Both Synths are preset compatible, although Singularity will convert Layer 1 to Unison Layers. 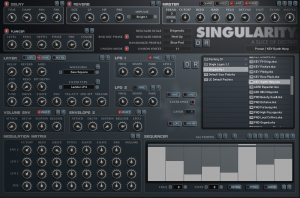 Singularity Lite is a fully fledged single oscillator Synthesizer which uses Raw Waveforms as the Oscillator. It has 2 Envelopes, 2 tempo clocked LFOs and a Sequencer which are all assigned through an extensive Modulation Matrix. Although Singularity is a single layer of Destiny, it still uses the 11 Layers as a Unison mode and so is good for Supersaw type sounds. All Presets can also be loaded into Destiny and vice versa. There is also a version of Singularity that is included with Destiny, the only difference is that Singularity Lite uses a reduced number of Waveforms. Best of all, it’s free! Augment began with the idea that it would be interesting to use Sequencers to manipulate Additive Partials in a rhythmic way, but it soon became apparent that it would be a much more interesting instrument using other waveforms as a huge 11 Layer Synthesizer. 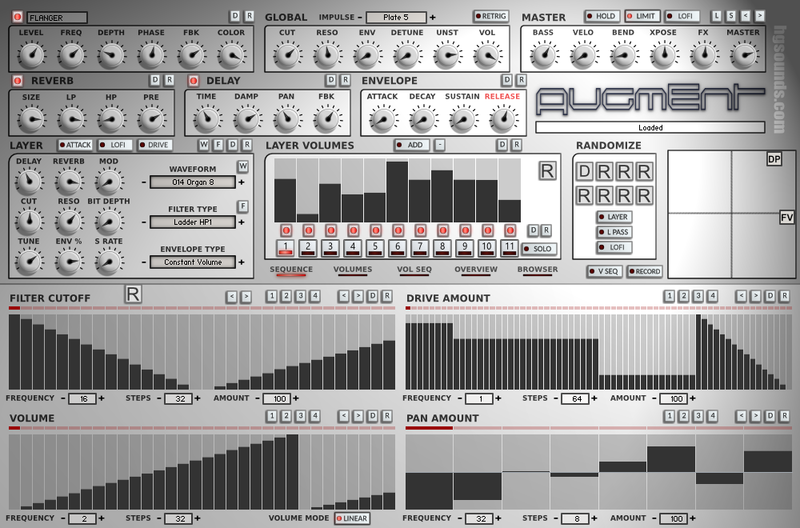 As a result Augment retains the additive mode but also uses 200 Waveforms which can be freely selected for each layer. The Waveforms are along the lines of PCM Synths of the past which have an Attack Section and a looped constant tone which works well as it allows the sounds to be more focused on Synthesis rather than sampling. The Attack Section can be disabled per Layer so they become pure tones. As far as the Sequencing side of Augment goes, the intention was to have sounds which have highly rhythmic components which are locked to tempo. The idea that you have a Pad which will come alive with rhythmic complexity when played alongside other Rhythmic sounds was at the forefront of the design. The Sequence destination are Filter, Volume, Drive and Pan. All sequencers are monophonic with the exception of the Volume Sequencers which are Polyphonic. Movement has been updated to v1.4 and is available to download from the usual place. It fixes an error where bank 4 was pointing to the wrong Samples. It won’t affect existing projects, but just in case the original is in the ‘Old Version’ folder should it be needed. 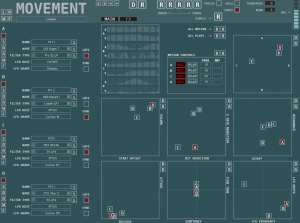 Movement has been updated to v1.03 which adds a further 80 Presets. You will find the update on your Downloads Page as usual. 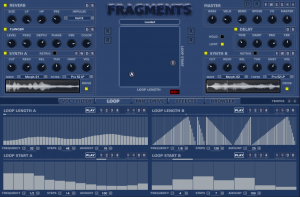 Fragments is an attempt at exploring Granular style synthesis within the Kontakt system. It uses Long Evolving Waveforms and the sound is generated by playing Looped Sections from these WAVs. The Loop Position and Length can be Sequenced in real-time via the Dedicated Loop sequencers which can create both Glitchy and interesting Pads. It has a Dual Synth Architecture with both synths sharing the same features. As well as the 2 Loop Start and Length Sequencers, there are also another 6 Per Synth which control Cutoff, Volume, Pan, Drive, Reverb Send and Delay Send. The Sequencers use tempo based divisions making them great for tempo Synched Patterns, have a maximum of 128 steps and 11 choices of tempo division. There are also 2 XY Pads which represent the currently visible Sequencers and will animate to show their current state when the Sequencers are in play Mode. They can also be used to record the Sequencers in real-time. When a sequencer not in Play Mode the XY controls the static value used for the destination amount. Fragments was designed to be intuitive and easy to use with all parameters + 4 Sequencers visible. As with other HGS creations full use of local and Global Randomizers are available to instantly create unique and varied presets.There is also an internal presets system in place with a built in Browser.